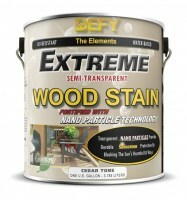 Defy Extreme Wood Stain - Utilizes Nanoparticles (Similar to Sunscreen) and High Grade Synthetic Resins. 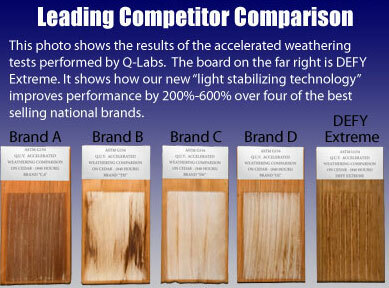 When combined they will reflect the sun and provide UV protection that has never been seen in a Tinted Wood Finish. This is a First in the Industry! Defy Extreme Wood Stain - Can be used on exterior smooth or rough wood surfaces including: wood siding, decks, outdoor wood furniture, and other hardwood surfaces. Nanoparticles are similar to Sunscreen. 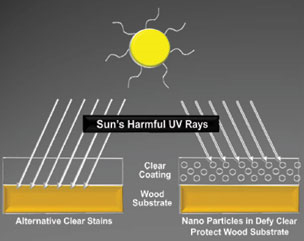 When the Particles are distributed at a rate of over 30 trillion per square inch, they will reflect the sun and provide UV protection that has never been seen in a Wood Finish.